I love my crock pot but hardly ever use it, so I’ve been on the lookout for some new recipes. A friend of mine posted about a “pantry dump” she did in her crock pot recently and how good it turned out, so I thought I’d do the same thing. The result? DELICIOUS spicy Mexican black beans! The beauty of this is that you can add whatever you want. My friend put chicken in hers. Since I’m a vegetarian, and that’s mainly how my husband eats at home, we just used beans, veggies and spices. I picked up a few things at the store, but you probably have most of this at home. I think next time I might add a can of drained corn. I was hoping to use that this time, but I didn’t have any. This dish is easy to make. 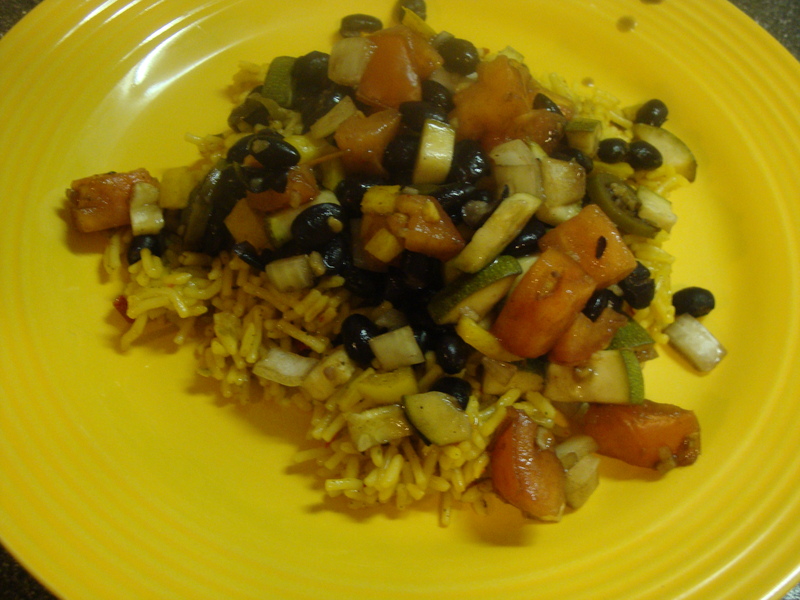 Take whatever ingredients you want (we used black beans, zucchini, onion, tomato, jalapenos, a yellow pepper, taco seasoning and hot sauce) and put everything in your crock pot. Turn it on low for about 1.5-2 hours. Then, serve over rice. We used Knorr Mexican Rice, but next time I think we might just use plain steamed white rice. See? How yummy does that look?? It was so good that my husband requested I make this every week. I am happy to oblige since it takes virtually no time at all. That’s my kind of meal! Combine everything in crock pot and cook on low heat for 1.5-2 hours. Serve over rice.